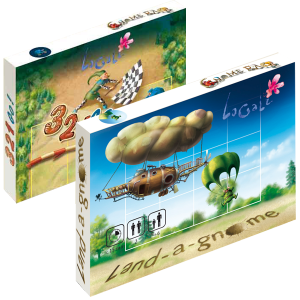 The Gnome Race property comes with 3 different kinds of travel games. Travel games are intended for 2 persons. They offer a challenging past time using a very limited amount of place. In 3 2 1 Gnome the idea is to be the first player to get your gnomes in reverse order to the other side of the board. There are only a very limited amount of 2 player games available. So we designed 3 different ones. Each of the games we created is using a new and unique game play. Simple to learn, challenging to win. The specific design of the games is such that they excel for use during travel. The tiny game board makes it possible even in the smallest economy seat in a plane to keep you entertained for hours.